The government's decision to acquire 15 former USAF F-111G aircraft was a major surprise for most observers of the Australian defence scene. Fortuitously for the ADF, the government did the proper thing and followed through on its promise, with the aircraft entering service over the last twelve months. The primary reason for acquiring these aircraft was to reduce the number of hours flown on the F-111C airframes, which like all highly stressed airframes have a finite number of flying hours in their structures. Spreading the flying hours across the expanded fleet effectively extends the life of the F-111A/C airframes. The F-111G airframes have substantially lower accumulated airframe fatigue than their TAC and RAAF counterparts, as they spent most of their previous life in Strategic Air Command. The issue of the F-111A/C fleet size has always been problematic, as the original purchase of 24 airframes to equip two essentially operational squadrons really fell somewhat short of the number of airframes properly required to provide full squadron strength, with an allowance for conversion training, depo overhauls and attrition reserves. The RAAF has always needed the extra airframes, but the US were loath to part with the aircraft during the Cold War and our government was always lukewarm on the subject, as it involved spending a lot of money. The only additional airframes acquired were the four attrition replacement F-111As which now equip 6 SQN. The acquisition of the G-model airframes has finally provided the airframe reserves to allow for full squadron strengths in a sustained operational environment. 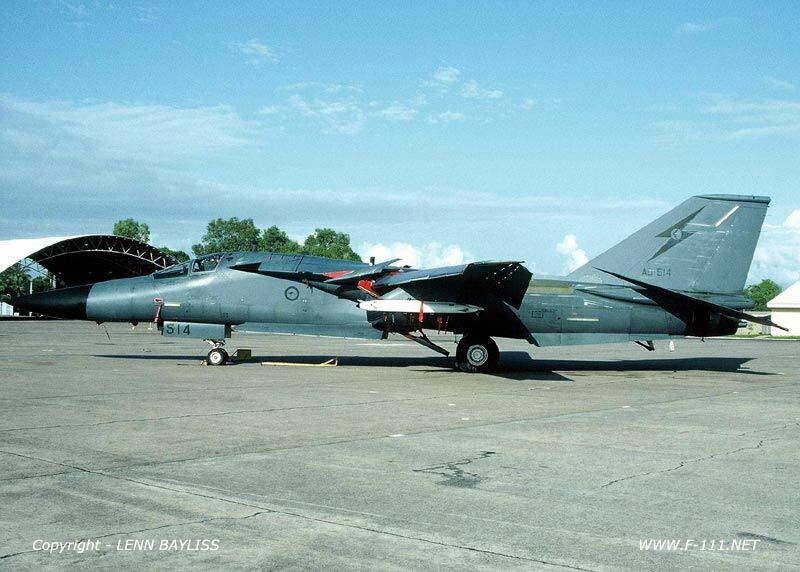 The RAAF's F-111Gs were built as General Dynamics FB-111A strategic bombers, serving with USAF Strategic Air Command (SAC) and tasked with suppressing Soviet strategic air defences and related C3 systems, using the AGM-69 SRAM missile. SAC had originally acquired 75 aircraft, with IOC being declared in October, 1971. These aircraft equipped the 509th BW at Pease AFB, and the 380th BW at Plattsburgh AFB. In SAC service the aircraft would have carried 170 kT W69 armed SRAMs or free fall 1 MT B43, 10 kT B57 or variable yield (10 -¿ 500 kT) B61 special devices. With a maximum payload of six SRAMs or freefall weapons, the FB-111A was truly a doomsday machine. Had the balloon gone up, the FB-111A force would have preceded the B-52G and H aircraft into Soviet airspace, carving glow in the dark corridors through the PVO's air defence SAM belts. After a distinguished but thankfully uneventful career in SAC, the FB-111A wings were deactivated and the aircraft reassigned to Tactical Air Command, to bolster the 4 Wing TAC F-111 fleet. TAC redesignated the aircraft as F-111Gs and formed the 427th TFTS at Mountain Home to operate the aircraft. The F-111G aircraft assigned to TAC went through a factory refit which substantially modernised the aircraft's offensive avionic suite and communications equipment, to a standard very close to the RAAF's AUP. From a technical viewpoint the FB-111A was a distinct variant in USAF service, an optimised strategic penetrator built to defeat the massive IADS of the Soviet V-PVO. 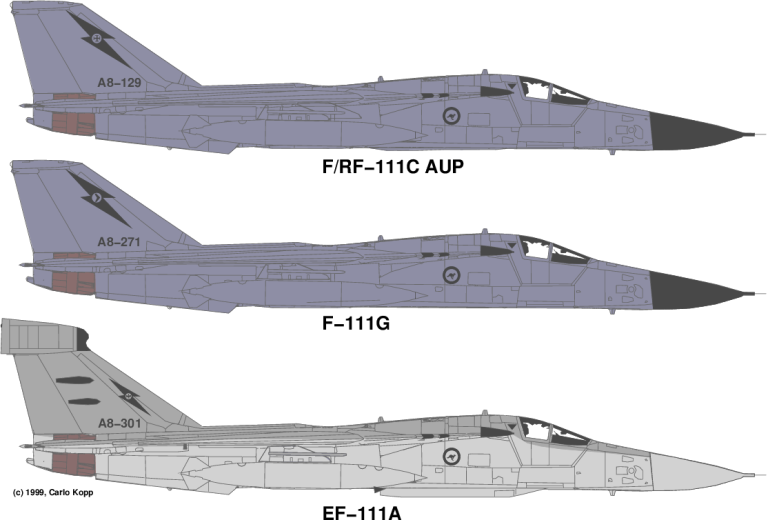 The airframe shared the big wing of the USN F-111B and RAAF F-111C, and the strengthened undercarriage of the latter subtype. The aircraft's fuselage was closest to that of the F-111D, and employed the stall proof Triple Plow II inlet geometry shared by later model airframes. The FB-111A was fitted with the TF-30P-7 engine which delivered nominally 16% higher thrust than the P-3 used in the earlier A/C and E models. SAC had specified a wide range of detail design changes to the aircraft, including a stowable crew access ladder, jettisonable weapon pylons, wiring and plumbing to the outer wing stations, various cockpit ergonomic changes (primarily in switch locations), dual 285/300 USG internal weapon bay fuel tanks and a distinct avionic and electronic warfare fit. The original offensive avionic system was built around an AJN-16 inertial nav-attack system and AYK-6 mission computer, both common to the F-111D Mk.II and F-111F Mk.IIB systems. With the D-model, the FB-111A also shared the AYN-3 cockpit display and the APN-167 radar altimeter. Unique to SAC were the newer APQ-134 Terrain Following Radar, the APN-185 Doppler navigation equipment and the ASQ-119 Astrocompass. The latter two items were needed to improve the aircraft's navigational accuracy on long polar sorties into Siberian airspace. The recent USAF avionic refit of the F-111G fleet replaced the antiquated seventies offensive avionic system with a contemporary digital computer and dual ASN-41 (Honeywell H523 or Litton LN-39) Ring Laser Gyro Inertial Systems (INS), integrated with new APN-218 Doppler nav equipment, which replaced the obsolete APN-185. The integrated nav-attack system uses Kalman filtering techniques to yield the best possible position estimate from the dual INS channels and the Doppler velocity readings, providing very high accuracy. A newer TFR was fitted, replacing the seventies APQ-134. The elderly ASQ-119 astrocompass was removed. The provisions to fire the SRAM missile were deactivated, as this weapon was not used by TAC. Much of the new avionic equipment is identical to the RAAF AUP systems, albeit slightly older production versions. The FB-111A defensive avionic suite was enhanced to provide for better survivability in the V-PVO's hunting grounds. While the aircraft shared the ALR-62 Radar Homing And Warning System (RHAWS) with the other variants, the improved ALQ-137 defensive ECM system was fitted, with additional aft facing antennas, improved band coverage and more sophisticated jamming techniques generation, compared to the TAC standard ALQ-94 (used by the A/C/D/E/F models). The only other type to carry this sophisticated system is the high value EF-111A tacjammer. Unlike most aircraft defensive ECM systems, the ALQ-137 combines both trackbreaking and noise jamming techniques. The AAR-34 IR tail warning system (MAWS) is retained, as is the ALE-28 chaff/flare dispenser. The RAAF F-111G aircraft retain the USAF (SAC) EW suite, and thus have the most capable ECM fitted to any aircraft in the Southern hemisphere. Compared to the basic F-111C airframe, the F-111G carries an additional 585 USG of JP-4 fuel which is about 3,500 lb or 11% more than the basic capacity. The fuselage and wing tank capacity is identical, at 4990 USG or about 32,400 lb. The engines deliver almost 20% higher thrust in service. With the aircraft freshly out of the USAF avionic refit, the Doppler enhanced dual RLG INS provides superb accuracy, in fact the F-111G is the most accurate bomb delivery platform in RAAF service today, with blind radar dumb bomb delivery errors a fraction of the analogue F-111C's sixties LN-14 system's errors. It will be interesting to see whether the post AUP digital F-111C system matches the F-111G. Australian Aviation had the opportunity to discuss aircraft performance with the 6 SQN G-flight aircrew deployed to the Avalon airshow. The RAAF crews are very happy with the aircraft, which are easier to fly than the standard C-model aircraft due the more robust intake, accelerate and climb much better due higher installed thrust, fly further due greater fuel capacity, and are so accurate with the Doppler enhanced INS that the navigators have to be selective about terrain features used for INS updates, so as not to fall foul of accuracy limitations in current maps. Current RAAF intentions are to refit the aircraft with the digital flight control system to be used on the AUP F-111A/C and the AWADI/DSTO ALR-2002 Radar Warning Receiver also to be fitted to the F-111A/C. This would save maintenance costs on two of the most critical aircraft subsystems. There is no intention at this time to rework the remaining F-111G avionic system to the AUP standard. This is a sensible decision, as the F-111G offensive avionics are only several years older than the AUP systems, of the same generation of technology, and share many common components. An issue will be integration with RAAF specific weapons such as the AGM-84 Harpoon ASM. Such weapons, whilst not particularly technically difficult to integrate, do require some software and hardware changes, and it remains to be seen whether the RAAF will do so. Even if the RAAF does not integrate its full suite of PGMs into the F-111G avionic system, the aircraft can still be most effectively employed in defence suppression and blind radar (dumb) bombing sorties, and as laser guided bomb or standoff weapon carrier aircraft, paired with an F-111C which would use its Pave Tack or datalink to guide weapons for both aircraft. This approach was used very effectively both by the USAF and the RAF in the Gulf, the latter having many more bombers than laser designator pods. It is worth noting, that the F-111G with its better performance, endurance and defensive ECM capability would make an excellent electronic combat platform to support the strike aircraft as anti-radiation missile (eg HARM) firing platforms. The RAAF would be well advised to consider this in the course of the upcoming ALR-2002 upgrade, and look at fitting the G-model 2002s with Emitter Locating System (ELS) facilities for this purpose. This would be a very cheap way of enhancing the RAAF's electronic combat capability, as the incremental cost of adding an ELS capability to the 2002 is much lower than fitting out with additional equipment. To date electronic combat has not received the attention it properly deserves in the ADF force structure, and the 2002 upgrade is a golden opportunity to redress this deficiency at a minimal cost. It is the author's view that the F-111G acquisition was the single best value for money defence purchase in the last two decades, and has finally brought 82 WG/SRG up to an operationally effective strength. We can hope the government will fully capitalise on this wise investment. The F-111G provides better performance, endurance and Electronic Counter Measures capability than the existing F-111A/C fleet. As such the aircraft would be well suited to the electronic combat role, supporting the strike aircraft with anti-radiation missile fire. Modifications to support this role could be readily accommodated during the planned ALR-2002 RWR upgrade. This would be a very cheap way of providing the electronic combat capability which the RAAF, uniquely among Western air forces, at this time lacks.